Programmed cell death is an integral part of embryonic development. Exploring the regulation of the process, LMU researchers have shown that so-called microRNAs protect the precursors of neurons from ‘precocious’ elimination. Programmed cell death – apoptosis – is a fundamental and tightly regulated process that occurs in all higher organisms. It is, for example, essential for normal embryonic development, during which superfluous cells must be disposed of in an orderly fashion. 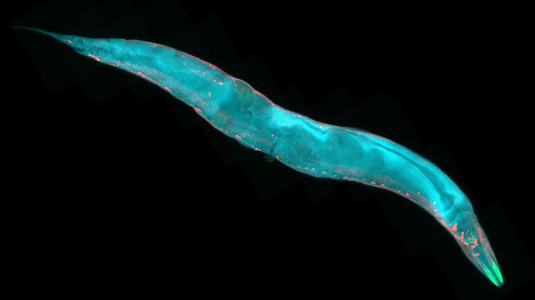 Barbara Conradt (Professor of Cell and Developmental Biology at LMU) and her team have been studying the role of apoptosis during embryogenesis in the nematode worm Caenorhabditis elegans, a well-established experimental model. They have now shown that small fragments of RNA, so-called microRNAs, have a crucial function in the regulation of apoptosis in this system – they are responsible for the preservation of the progenitors of the nervous system. The new study appears in the journal Genes and Development. microRNAs are short RNA fragments that have a significant role in the regulation of gene expression. They bind to specific mRNAs on the basis of their nucleotide sequence, thus preventing them from binding to ribosomes and marking them for degradation. “We were able, for the first time, to quantitatively determine - at the single-cell level - how particular microRNAs affect the levels of a target mRNA during the course of embryonic development,” Conradt explains. “That is unique about our study.” The progenitor cells investigated divide to give rise to daughter cells that differ in size. The smaller daughter undergoes programmed cell death, while the larger differentiates into a neuron. When Conradt’s team genetically blocked the production of specific microRNAs, the level of egl-1 mRNA in progenitor cells - and thus presumably the amount of the killer protein produced - rose significantly. “Depending on the cell lineage and the nature of the mutation used, up to 80% of the precursor cells died before they could divide,” says Conradt. Under normal circumstances, when the precursor cell has divided, the functional microRNAs inherited by the smaller daughter cell are rapidly inactivated. Within minutes, the level of egl-1 mRNA rises sharply, enabling large amounts of the killer protein to be synthesized – and within 30 minutes the cell is dead. “How the inactivation of microRNAs is regulated during this rapid transition is not yet known,” says Conradt. – So it’s a safe bet that the spatial and temporal regulation of microRNAs will be the focus of future studies from the Conradt lab.